How much thread do I need for beadweaving projects? 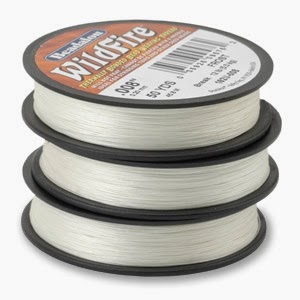 One of the most commonly asked questions during beadweaving classes both in our retail bead stores and online via YouTube and social media is “how much thread do I need” or “how much thread should I start with?” Regardless of which type of beading thread you are using (Wildfire, Fireline, Nymo, C-lon, S-lon, KO Thread etc. ), remember that you do not have to have exact amounts prepared before hand. Many people do not realize that you can ADD thread to nearly any project relatively easily and quickly. Because finding out exactly how much thread you need can be tricky to estimate, you don’t want to start with too much. At the end, that extra thread could be wasted. Most importantly, a large starting length of thread means that you will have to pull all of that through each bead on your project! Too much thread will slow you down. https://youtube.googleapis.com/v/BmjC1m4ghGc&source=udsInstead, we almost always recommend starting with 1-2 arm lengths of thread (3-6 feet), then adding on more thread as required. You can also increase the length of your tail when first starting, then shorten it as your progress along the project, as another way of easily reducing the amount of thread that you are pulling through each bead. For more information about how to add thread, see this YouTube video to the right. As always, we welcome you to visit us in our bead stores, watch hundreds of free YouTube tutorials, and shop with us online!